Incompetent Pac-12 Officials: How Do You Miss ALL of THIS? “Did his head just bob? Was that a face-mask tug on Vernon Adams?” Steve Richardson, a long-time astute Oregon observer and fellow football analyst, stated aloud what I was thinking. We played the run back and yes, it appears that the defender reached up and grabbed the face-mask of Oregon’s new starting quarterback. A minute later we saw the replay up close and it was very apparent … but no penalty, and not even a mention of the foul by the broadcast booth. Pac-12 officials and the photo above — need we say more? Unfortunately that was not the only blown, missed, or ignored call in last Saturday’s contest. While I will grant everyone a mistake here and there, the volume of egregious officiating errors last week are too much to ignore. 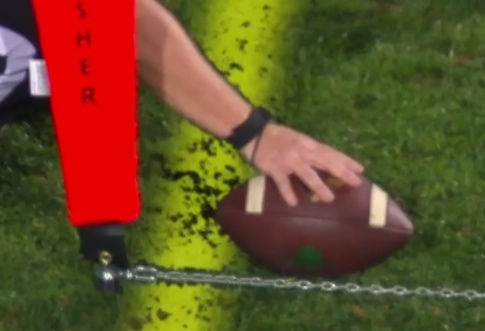 Oregon had their chances to win, but the Pac-12 officials made playing the No. 5 team in the nation on their home field that much more of an uphill climb. What you see above should have given Oregon a first down about 18 inches from the goal line with at least one more down to work with. Would the Ducks punch it in in that scenario? Would they at least get three? Unknown, but the likelihood of earning points from that position is much better than what occurred. 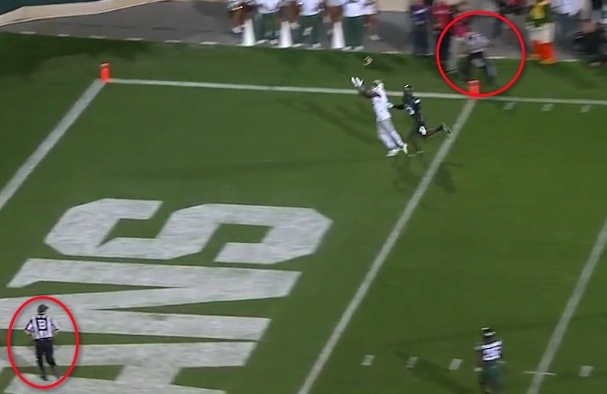 There was a Pac-12 official on the sideline and one in the end zone … how do they miss this? Early in the game Adams tried a long ball into the end zone that was just overthrown. Or was it? 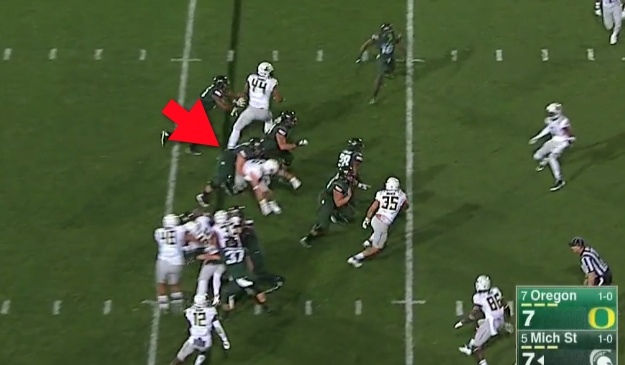 The Michigan State defensive back was tugging at Bralon Addison’s jersey the last ten yards of the route. The screenshot above allows you to see how close the ball was to being caught. Have you ever had someone pull on your shirt while running full speed? If so, then you know it hinders your ability to turn on the jets. You can’t drive the shoulder before the ball arrives! Meanwhile two Pac-12 officials (red circles above) either did not see it or turned a blind eye to a penalty that should have been called, especially given that it resulted in a loss of six points. 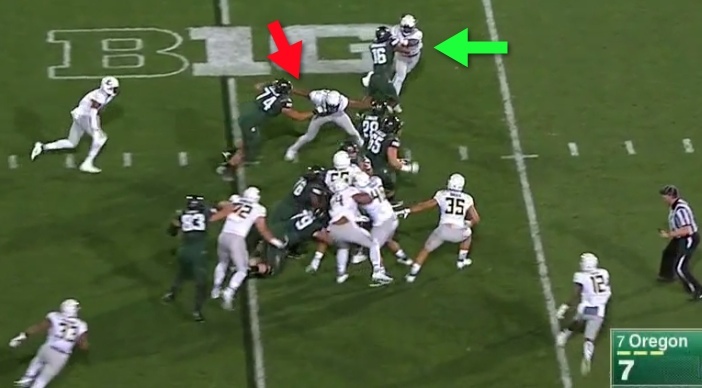 Similarly, I could not understand the interception granted to Michigan State (shown to the right) when it was clear the MSU defender was not looking for the ball, but was driving a shoulder into Charles Nelson! A defender has just as much right to the ball as the offensive receiver on a contested throw — assuming the defender is actually making a play on the ball, and not on the receiver. Was the Nelson’s defender going for the ball? Or was he slamming into one of our beloved Ducks and then ripping his arms up to pop the ball out? Sure seems like the latter. Why are officials even present? The above photo shows an impending incomplete pass, but only because of the interference occurring on the left side of the screen! 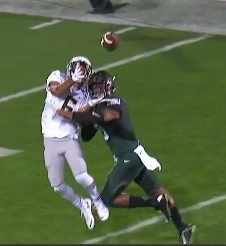 The ball is clearly going to the Oregon receiver, but No. 33 for the Spartans has his arm and hand ripping the Oregon jersey again to keep him from separating to the football. How is it that nobody on the field sees this? 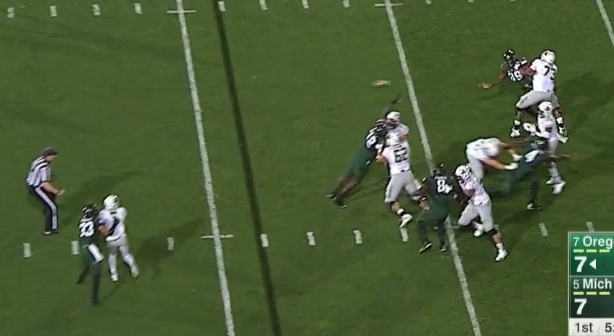 The big 62-yard run by Michigan State on the game’s first play could not have happened without two blatant holds by Michigan State players. Yet the Pac-12 officials were complicit in allowing it. Above you see Christian French (red arrow) and Arion Springs (green arrow) being held at the point of attack. With normal blocking this is probably a 4-5 yard gain, but with championship holding, it set up seven points for the Spartans. French (red arrow above) and Springs (green arrow above) cannot rip loose of the holding in time. How many Pac-12 officials were there on the field? This is really, really good holding above. I saved the best holding example for last as I’ve never seen anything like this. Alex Balducci (No. 56) shifted before the ball was snapped, then stood up his offensive lineman and proceeded to step into the hole to make the tackle for a short gain. After getting beat, the Spartan lineman grabbed Alex from behind at the waist and strained to hold the Duck back! Is Balducci trying to fly? You see Balducci (above) wave his arms as he is being set up for a freestyle wrestling move; he never had a chance to make the tackle! Grabbing a defender at the waist from behind … and getting away with it? Of course this occurs with the legendarily hapless Pac-12 officials! It became obvious to Steve and myself that the Pac-12 officials were going overboard to appear unbiased toward Oregon. Thus, we began to assume the Spartans were not going to get called for penalties — even the most apparent ones. And finally, the spot heard round the world, folks. You can see it above. On fourth down, everyone saw how Vernon Adams stretched over the first-down line for more than the first down — before his knee touched the grass. How could they spot this here? Yet they placed ball behind the line? Even the ESPN broadcasters questioned this, stating “our yellow line is pretty accurate.” If they were relying on a knee touching before the lunge, the ball would have been two feet back. 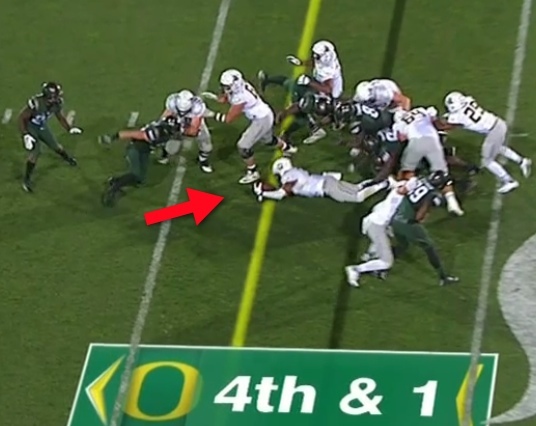 As it was called, this spot absolutely makes no sense, and Oregon lost the ball on downs as a result. I have no complaint; if we deserve the penalty, then the call should be made. But it has to go both ways. Why not just let them play? Then why have any rules at all? Do Pac-12 officials really condone mugging receivers, wrestling defensive linemen, and holding — whether slight or monstrous? Does anyone know Larry Scott? The Oregon coaching staff expressed their squad’s many opportunities to win the game, and placed the blame all on themselves. They are a classy bunch, while fans like myself want to ask the tough questions of our conference commissioner.